Food Probes allow you to monitor the internal temperature of meat without opening the cooker. Insert one into the center of your meat, set your alarm and pull your food off at the temperature desired. The plugs have LEDs that glow to indicate alarm conditions for each sensor. 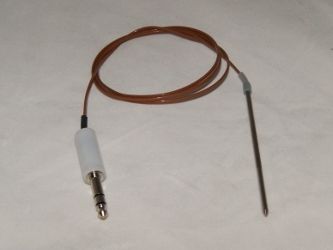 The probes are 4ft in length and can be used for temperatures up to 450F. The metal tip is 5 inches long with a moderately sharp point.